AT LAST, SIR TERRY, WE MUST WALK TOGETHER. The Daily Zombies bid farewell to one of the most intelligent and funniest minds of this generation, Sir Terry Pratchett. It is truly a sad day here at The Daily Zombies as we bid farewell to one of the sharpest minds in literature of our generation today. Fare thee well, Sir Terry Pratchett. The author behind the much-beloved Discworld fantasy novels, among other bestselling books, Pratchett has gathered quite the remarkable legacy for his signature writing style of incredibly funny yet utterly clever satire of the fantasy genre. With a 41st addition completed last year, Pratchett is easy best known for his prolific comic fantasy series, Discworld, while his 1990 collaboration with fellow British writer Neil Gaiman, Good Omens: The Nice and Accurate Prophecies of Agnes Nutter, Witch, is also one of his most acclaimed works. Appointed Officer of the Order of the British Empire (OBE) in 1998 and knighted for services to literature in 2009, Pratchett first announced that he was suffering from Posterior Cortical Atrophy (PCA) back in 2007. Following the completion of the 41st volume of Discworld in the Summer of 2014 and leaving his proudest legacy in the good hands of his daughter, Rhianna Pratchett, a notable fantasy writer in the video game industry, Pratchett succumbed to the final stage of the disease on 12th March at the age of 66. Larry Finlay, MD at Transworld Publishers: “I was deeply saddened to learn that Sir Terry Pratchett has died. The world has lost one of its brightest, sharpest minds. Terry faced his Alzheimer’s disease (an ‘embuggerance’, as he called it) publicly and bravely. Over the last few years, it was his writing that sustained him. His legacy will endure for decades to come. Terry passed away in his home, with his cat sleeping on his bed surrounded by his family on 12th March 2015. Diagnosed with PCA in 2007, he battled the progressive disease with his trademark determination and creativity, and continued to write. He completed his last book, a new Discworld novel, in the summer of 2014, before succumbing to the final stages of the disease. There have been so many visitors to the Terry Pratchett website and forum since Thursday's desperately sad news, and as a result the website has crashed. Normal service will resume as soon as possible. 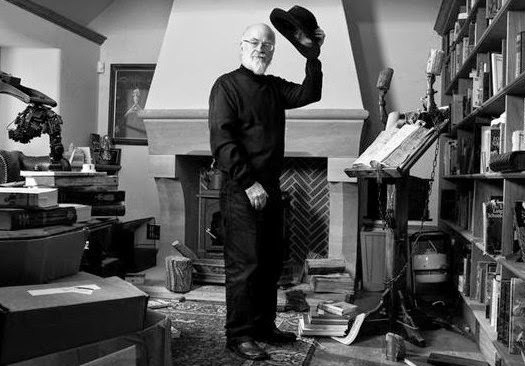 In the meantime, please do visit his Facebook page at www.facebook.com/Pratchett where readers from across the world are sharing their thoughts.